14.5 Litres of liquids, and all will be used in 39C+ heat. Sharing the trail with mountain bikes. Lots of side trails to explore. The road starts off big bike freindly. A cool morning along the river. The cool won’t last! Narrow road on the cliff. We’re hoping we don’t meet any 4x4s. 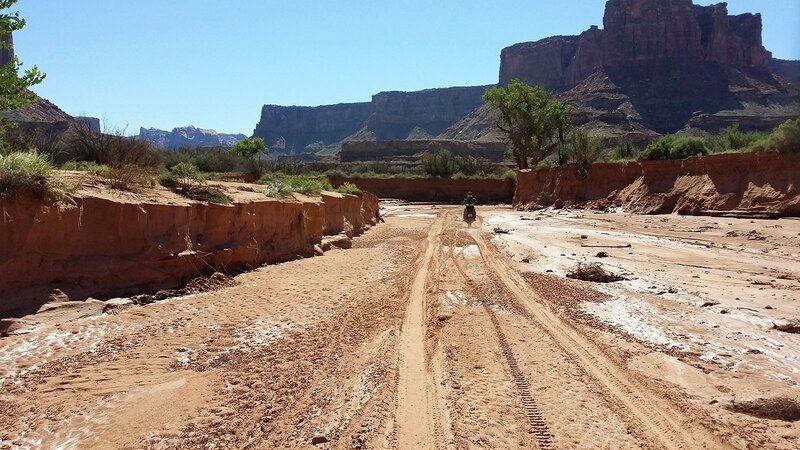 Riding through one of the washes. 3 Days Earlier this was under 5 feet of water according to a mountain bike tour we met. Things not to forget… Your water bladder. The road weaves its way back up from the river. 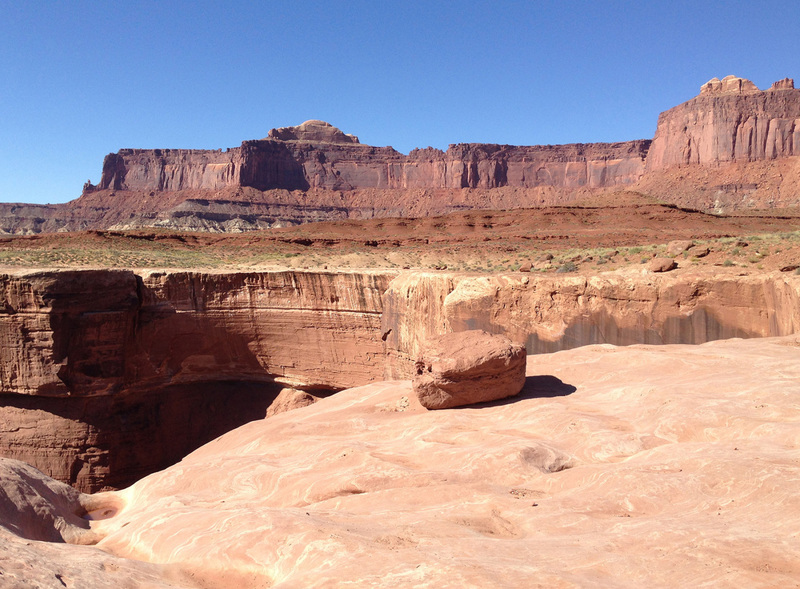 A great view of the Green River. 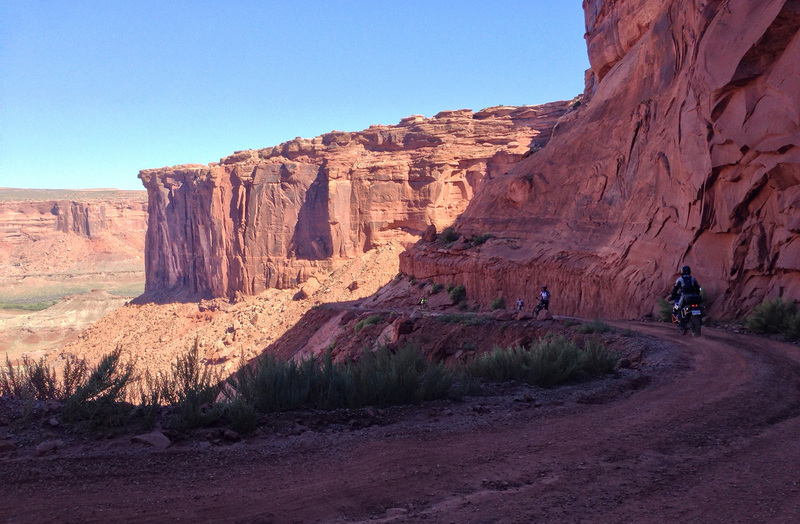 There are a couple fairly steep and sandy descents. 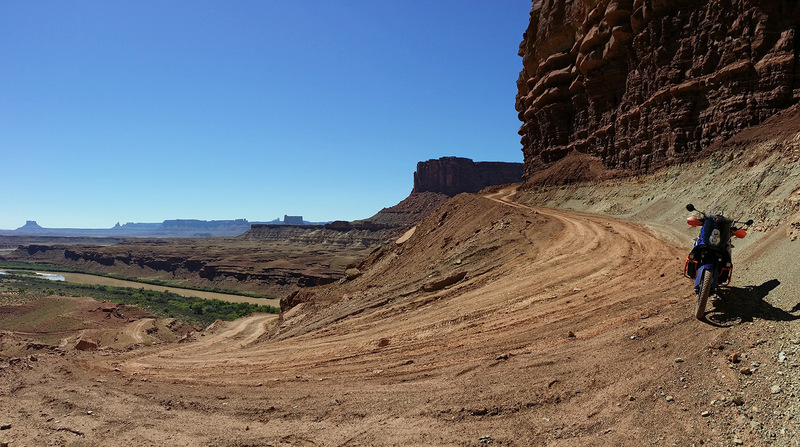 At times the road is just a vague path across the slickrock. Neil shows off his Alpinestars Durban suit. 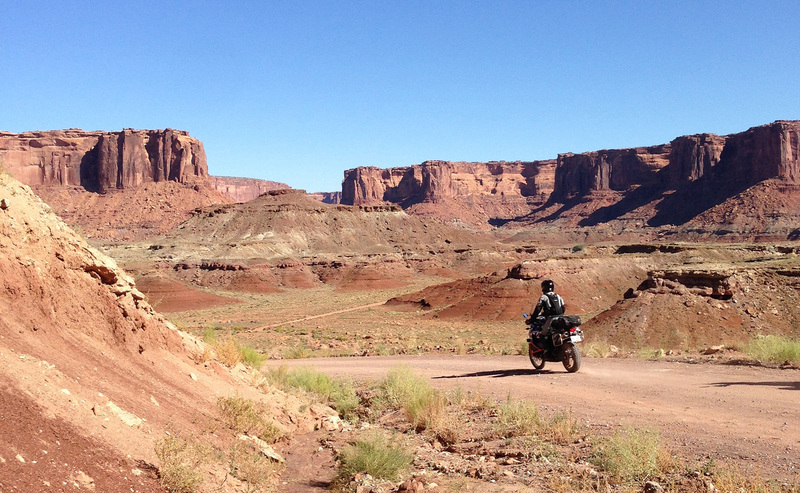 Appropriately it does seem Africa-hot in Moab. 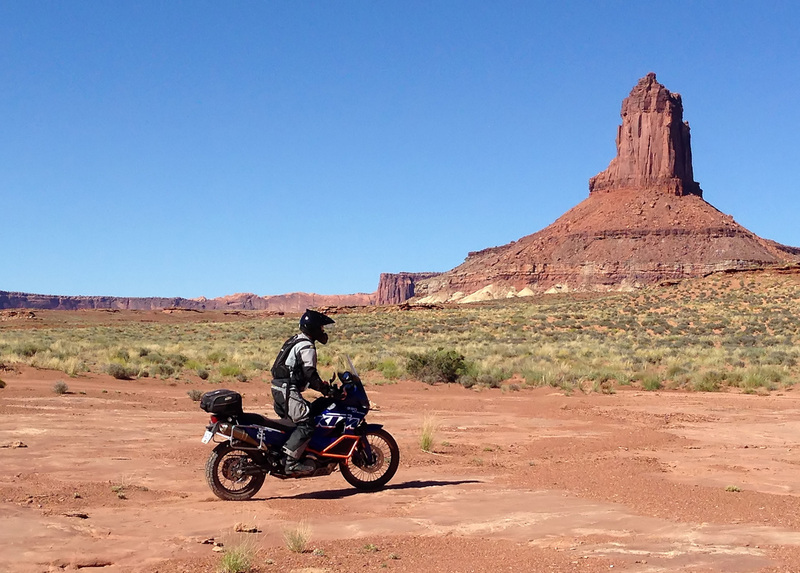 This is a KTM’s natural surroundings. 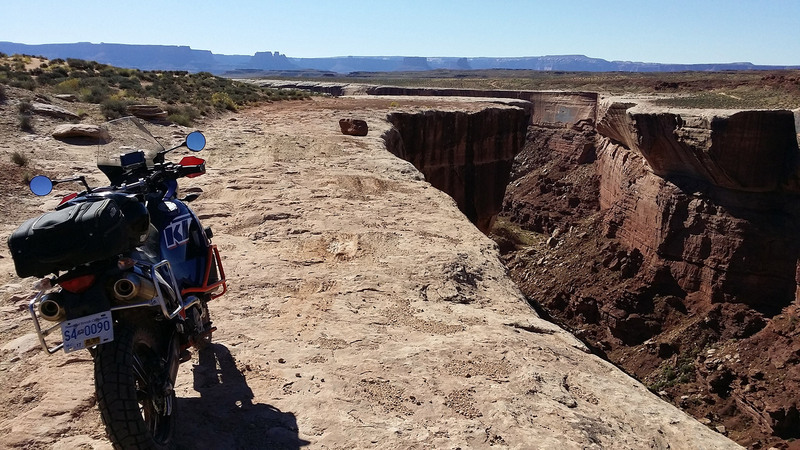 You probably don’t want to get too close to the edge. 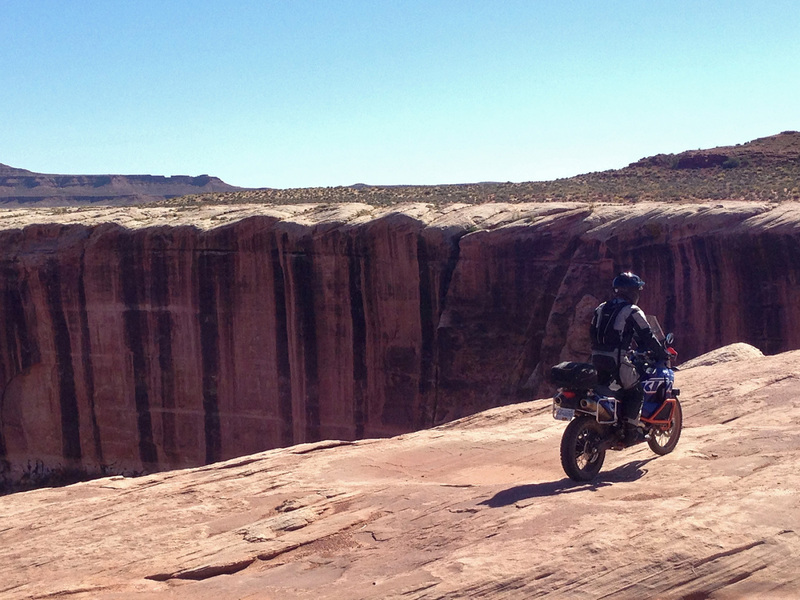 The slick rock road leads to your doom if you don’t pay close attention. Scale is often hard to put into perspective. A favourite picture from the day. The road markers will be harder to spot at night. 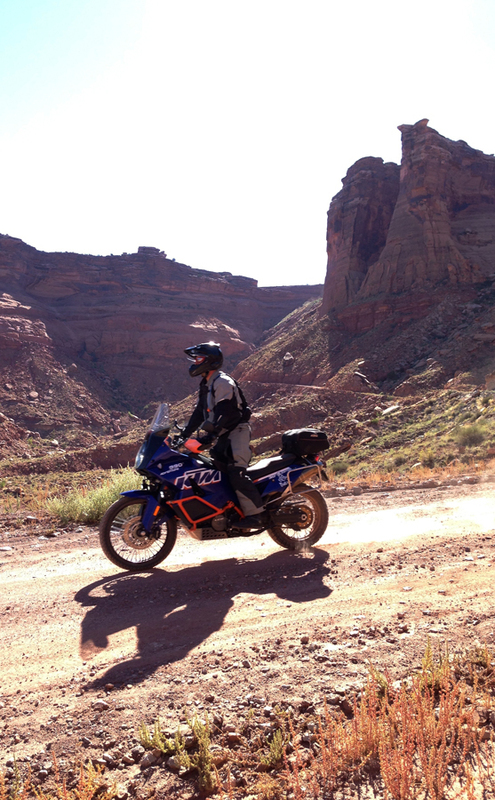 This is a KTM’s natural surroundings too. 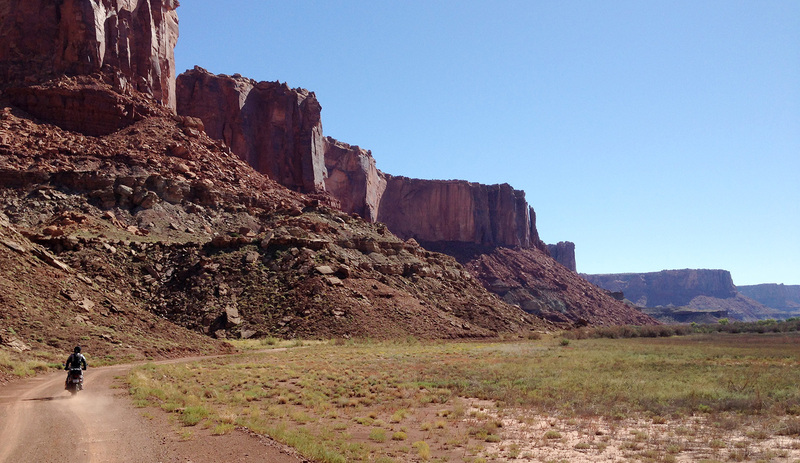 Heading into a box canyon, before ascending up and out of it. 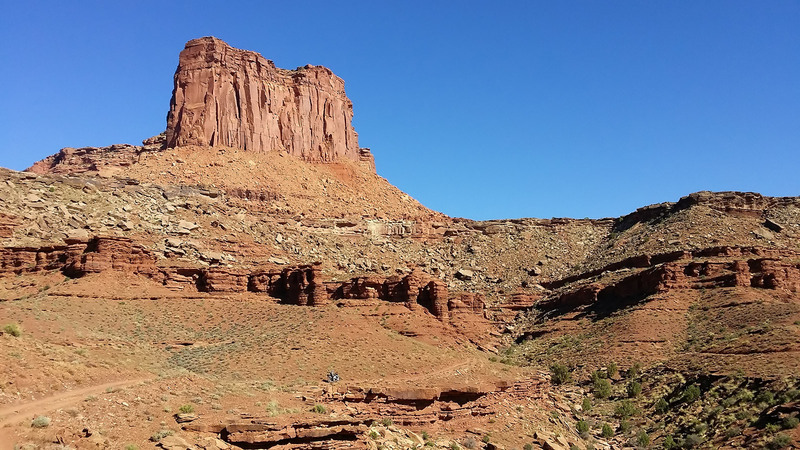 One feels puny in this landscape. Hopefully geological time doesn’t include the present. 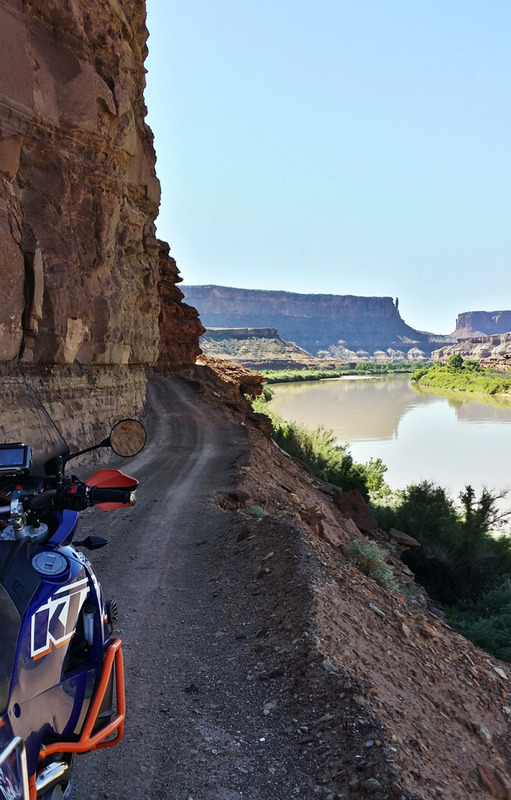 Around every corner is a stunning view of Moab. As the light wanes the colours grow more intense. And there are hours left to go. I’m walking across a wide open “campground”, where the sites are a several hundred meters apart. To disturb your neighbours under the darkening purple of the Moab sky, you’d have to work up a good, loud bellow. 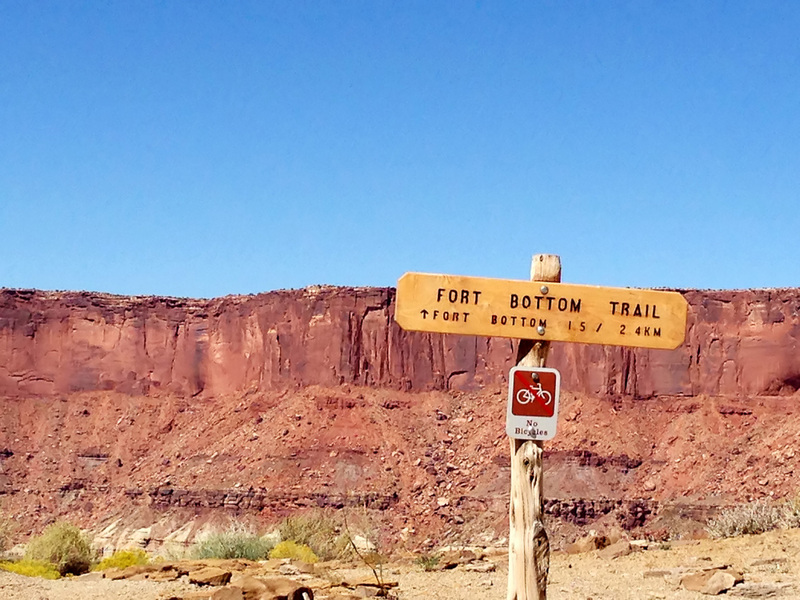 They do things big here, and it’s been a big day on the White Rim Trail in Canyon Lands National Park. Unfortunately, the day isn’t done. I shift my helmet in my hand, and do my best to look unthreatening as I slog in full gear towards the strangers with a truck and tent ahead. A comedy of errors, or an adventure, is still playing out today and we are desperately short of fuel. The heat has been a factor. 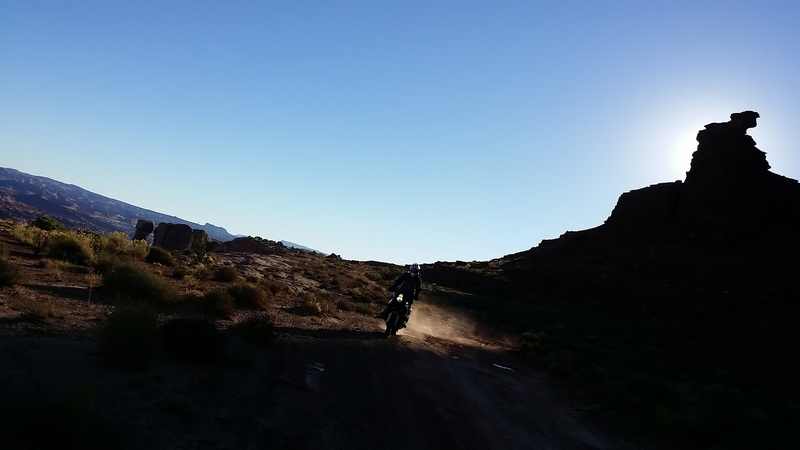 Our dual KTM 990 Adventures run hot, hotter in temperatures flirting with 40C. With fuel pumps sumped into the tanks, the gas has been boiling… and boiling away. Then there was that business with the geyser. 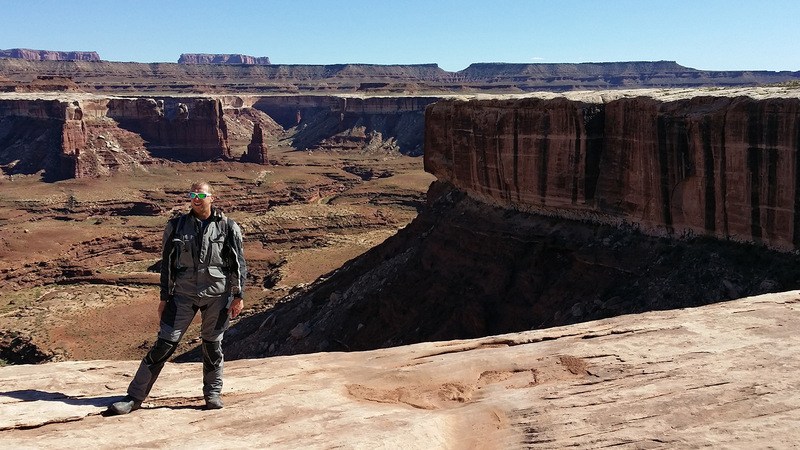 In the full heat of the afternoon, the tanks on Kevin’s 990 Adventure were whistling, off-gassing the boiling gas. To relieve the pressure, and not having a clear idea how much pressure there was, he popped the left one open. Gas shot up like a highly combustible version of Old Faithful, and sluiced back down on him and the bike. There went a couple of litres, call is aggressive evaporation. 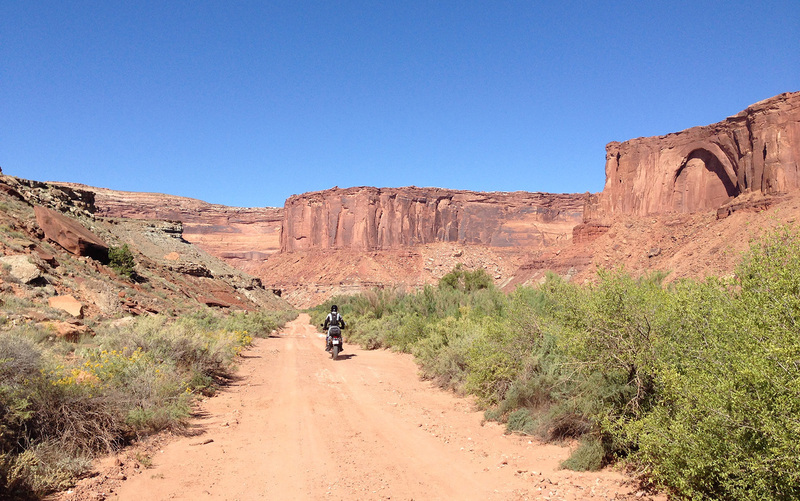 In truth, the ride has been all about the fluids. 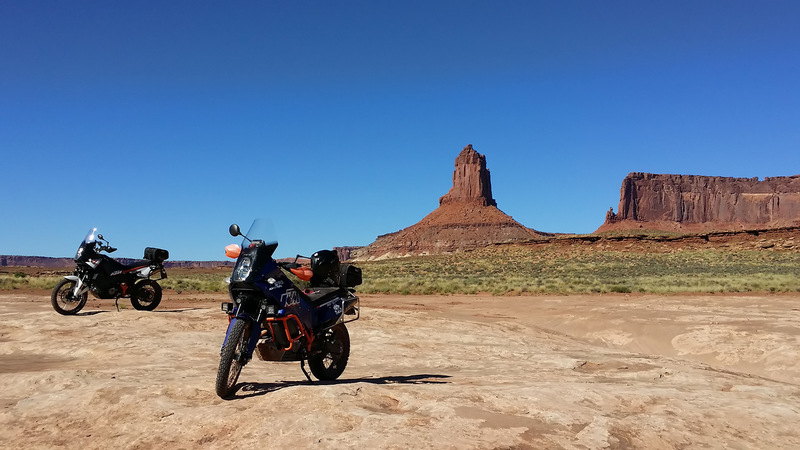 Prior to becoming the world’s most flammable KTM and rider, Kevin had ridden 10kms back to find a Camelback that I’d forgotten to put back on at a rest stop. 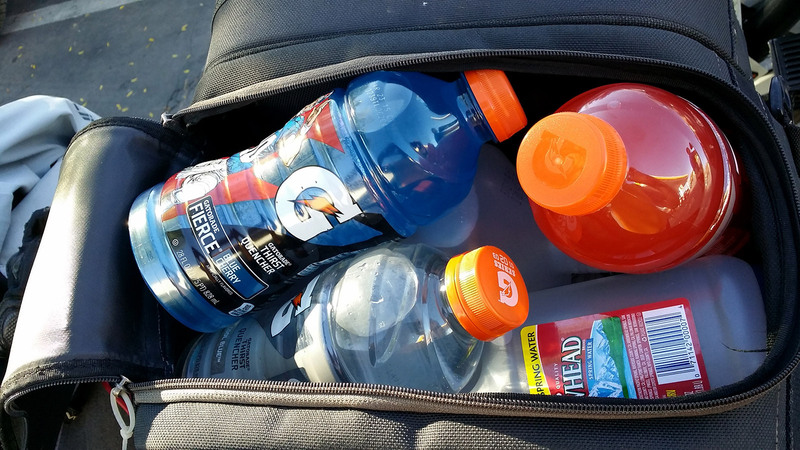 We’d packed 14.5L of consumable liquids between the Camelbacks and sports beverage in the tail bags, and we could have used more in this spectacular and spectacularly hot territory. For the record I’m not a hot weather person, 30C is generally the cut-off point for my comfort. At 36C my attention starts to wander, and I’m off game when it comes to physical exertion. 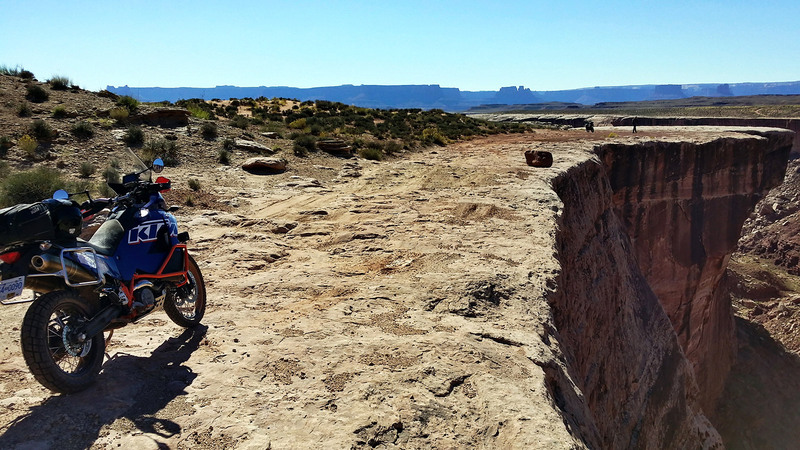 On the big KTM, I’d definitely file the White Rim Trail under “Challenging Physical Exertion” for a rider of my skill level. 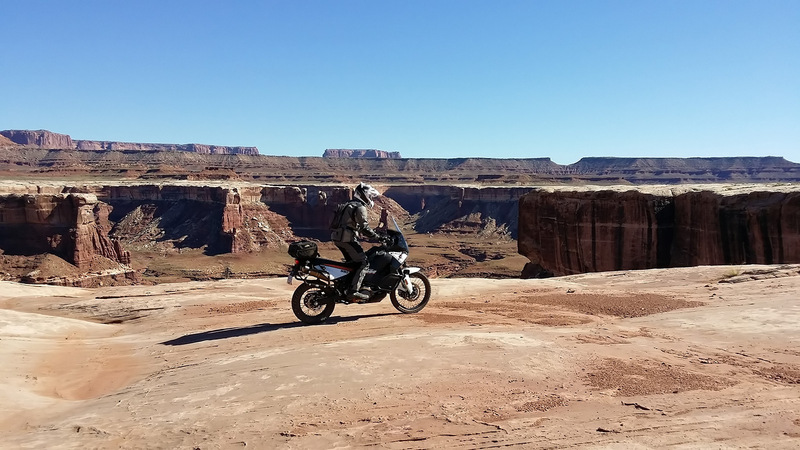 Given the option, a smaller bike like my 690 Enduro R would have been the tool for the job — except for the near week of riding to get here from Vancouver, BC. 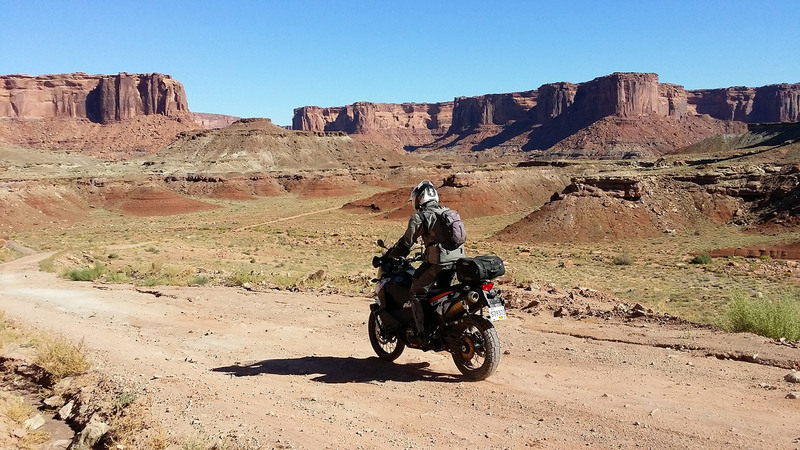 The trail isn’t massively technical, but it’s not a cake walk on a big adventure either. 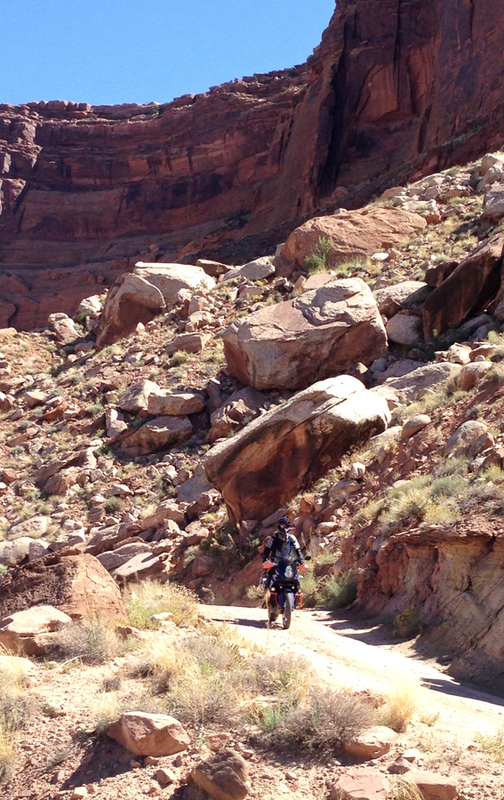 Steep descents, a river bed (that 3 days earlier was under 5 feet of water), rocky sections all make for a challenge. 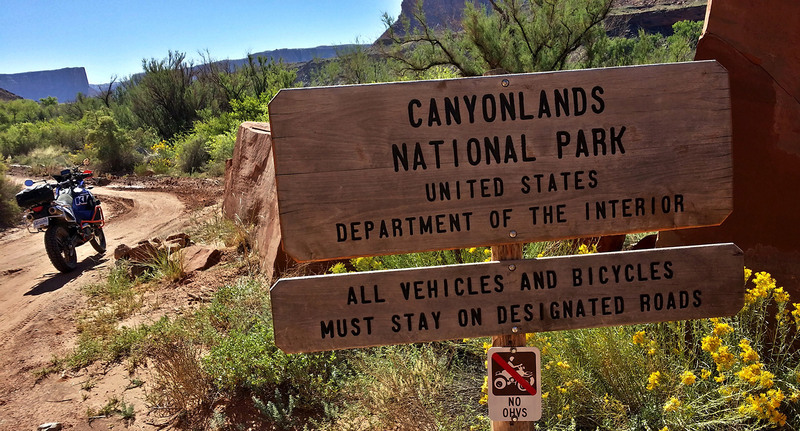 Then there is the marking of the road itself, which at times is a done with boulders indicating you should not ride over the canyon wall. Mind the gap as they say. 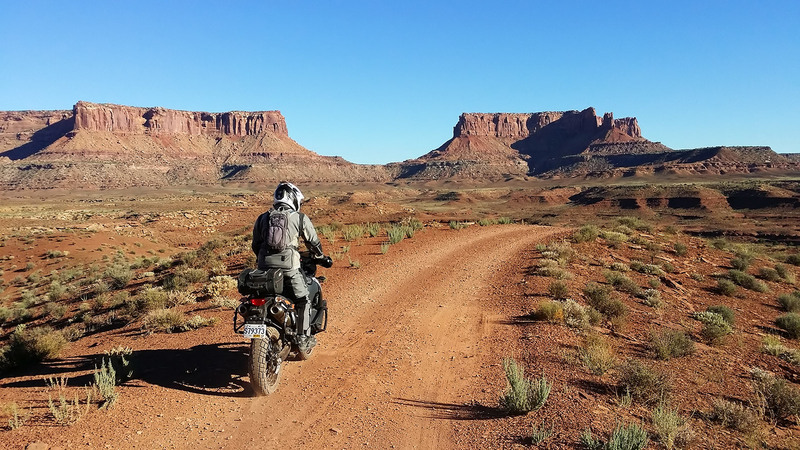 The White Rim Trail is unique in my experience; as close as one can get to riding into the grand canyon, but with better scenery and a good dose of ‘wow, we’re really alone out here.’ Words are pressed to do it justice, as are pictures, but the latter will have to suffice. 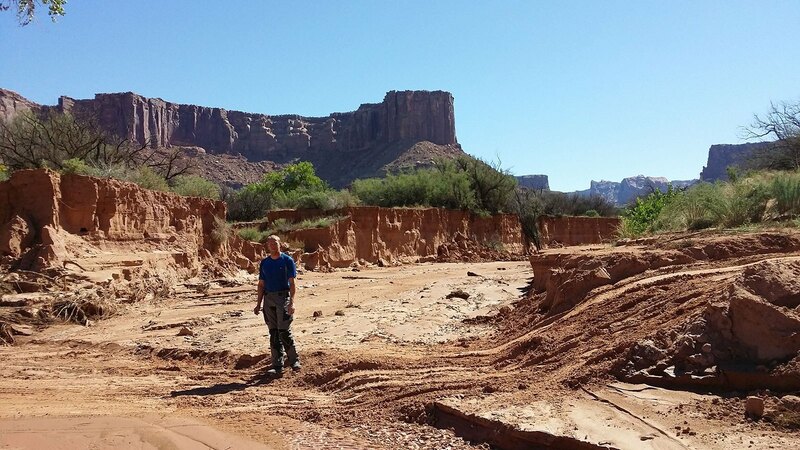 Our saviours are, Heather and Jeremy, a young couple traveling the trail in a rental 4×4, with gas to spare… if you can get at it. Our first attempt is to strip the drinking hoses from our Camelbacks and jury-rig them together into a siphon hose. The solution is a non-starter, as the truck is equipped with a siphon block in the fuel filler neck. There’s a quick disconnect for the fuel line along the frame rail though, and cycling the ignition key primes the fuel pump. A near perfect mechanism for filling those Gatorade bottles we’d been packing out with us. Utah though is trying to kill us, or Kevin at least. No sooner has Kevin crawled out from under the truck, again smelling heavily of gas, than Heather points out a juvenile rattlesnake that’s been by the vehicle’s front tire. The snake is remarkably persistent about standing its ground, if that’s the proper term for a creature without legs. We are not, and take to the road, at night… again. It’s been a day of quick karmic-turn arounds on the trail. Heather and Jeremy had a flat earlier on, and a group of 4x4s started to help. Earlier in our day we’d encountered the same group, with a Toyota Tundra whose transaxle’s electronic lockout was stuck in neutral. Kevin managed to diagnose and rig a solution, or at least pull the right connecter to short the transaxle into engaging, but we’d lost time. And, lost more time again to our impromptu refuel. So we’re riding well into the night. A ways down the trail we stop, turn off the bikes and all our lights go dark. The Milky Way scintillates across the heavens between the canyon walls. 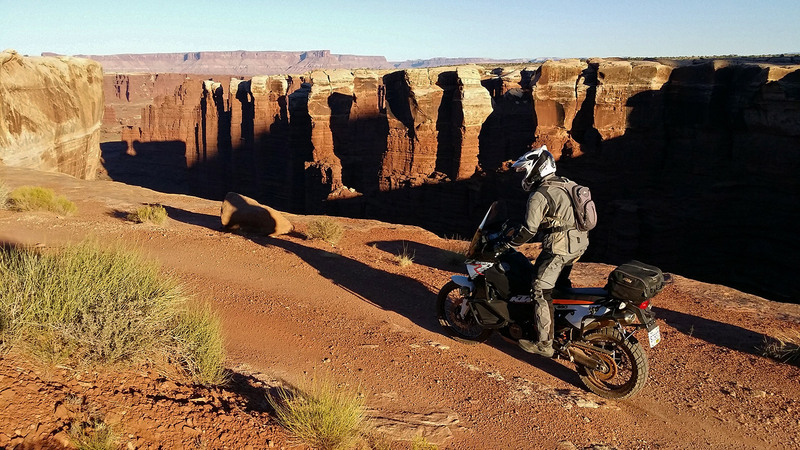 Canyon walls and edges you’d best be alert to while riding in the dark, those drop-offs don’t offer second chances. 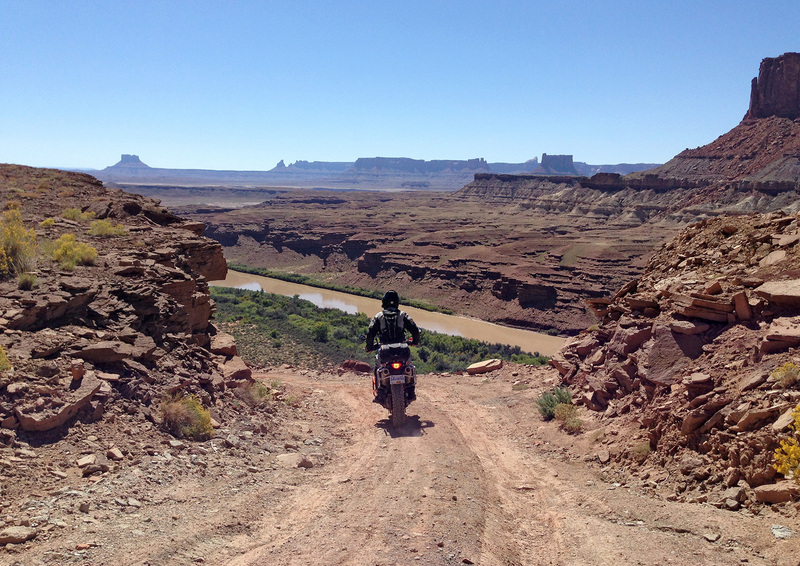 The White Rim Trail hasn’t been the easiest ride, but it’s one of the most visually fantastic.